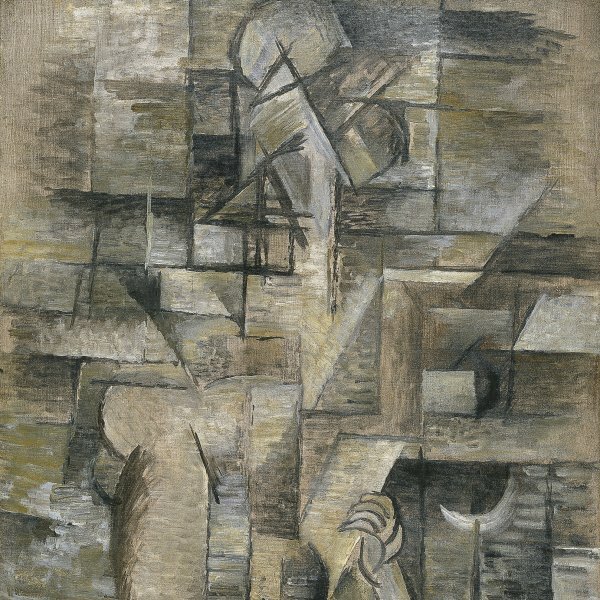 In the summer of 1909, Georges Braque and Pablo Picasso simultaneously took a fundamental step forward in the development of the Cubist language. Picasso settled in Horta de Ebro with Fernande and Braque worked in La-Roche-Guyon, on the banks of the Seine. 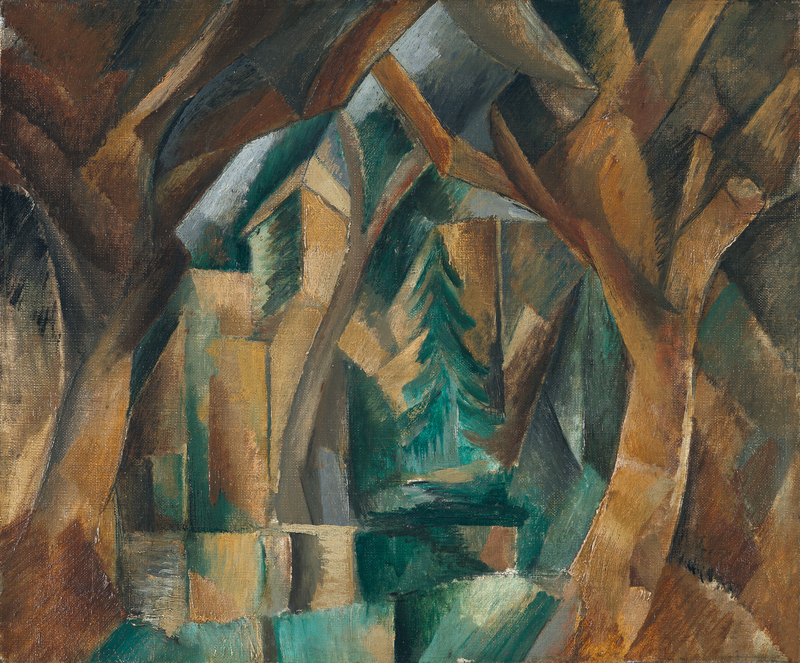 Braque’s painting was interrupted by military service between 7 September and 6 October, and on his return he travelled to Carrières-Saint-Denis, very close to André Derain’s home in Chatou. There he painted four landscapes including the present Park at Carrières-Saint-Denis belonging to the Thyssen-Bornemisza collection, which bears a certain resemblance to the composition of André Derain’s Church of Chatou, as both bring to mind certain elements of nature, but retain the flatness and geometrical structure of the canvas. In these proto-Cubist landscapes Braque continued with the simplification of form and exploration of a new sense of perspective begun at L’Estaque the previous year, borrowing from Cézanne’s painting a device that is essential to the new language: the vibrations, called passages by Pierre Daix, that caused forms to be merged. 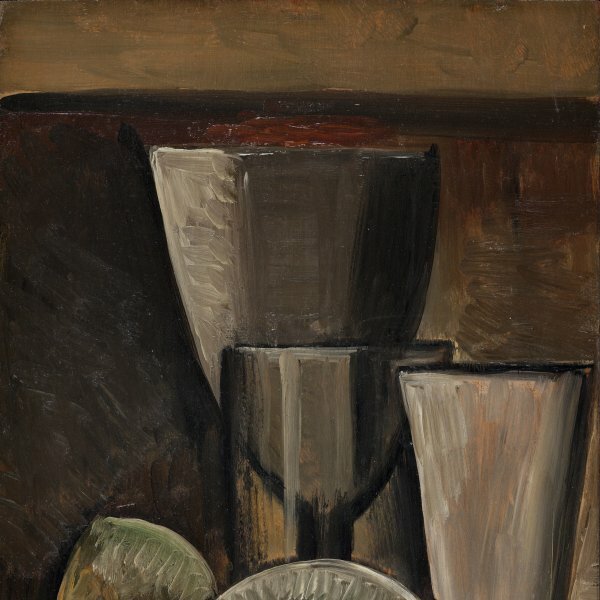 As Tomàs Llorens has pointed out, Cézanne achieved this effect by means of “short brushstrokes, generally in cold, dark tones, with which the master of Aix marks, as if with a shadow, some of the edges of the main volumes in his paintings, ” in such a way that although the image becomes less legible, the painting “gains unity, rhythm and stylistic coherence.” It is precisely this commitment to Cézanne’s two-dimensional treatment of space that Christopher Green highlights in Braque’s work when discussing the latter’s major role in the development of early Cubism. It should also be mentioned that the mark of the imposing pyramidal structure of the medieval castle of La-Roche-Guyon, which had inspired the compositions Braque produced immediately before the present work, would also be found in the geometrical component of his future paintings.